The Book Rat: GIVEAWAY: #GabbyDuran & the Unsittables prize pack! 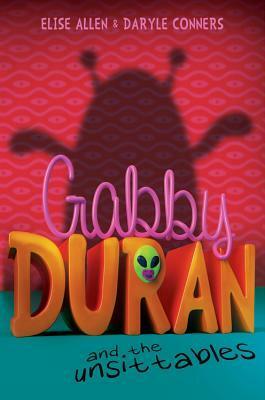 GIVEAWAY: #GabbyDuran & the Unsittables prize pack! ...which is why today's giveaway is kinda perfect. To celebrate the release of Elise Allen's & Daryle Conners' Gabby Duran and the Unsittables, Disney Publishing has put together some prize packs that are perfect for summer: book, drinks tumbler & toy, what more could you you want as a quick "here, my child, go out into the world and have fun with bookish things" summertime gift? It's kinda perfect. You can read an excerpt of the book here, but before you go, make sure you enter to win! The folks at Disney Publishing has put together an OUT OF THIS WORLD prize pack in celebration of the release of Gabby Duran and the Unsittables! a copy of Gabby Duran and the Unsittables! All prizing and samples provided by Disney Publishing. Must be 13 years or older, or have parents permission. Fill out the Rafflecopter to enter. EST. Good luck! Summary: The Association Linking Intergalatics and Earthlings (hereby known as A.L.I.E.N.) has a new member. After months of investigation, Gabby Duran, Associate 4118-25125A, has proven herself to be a babysitter extraordinaire. Her celebrity clients fly her around the country to care for their rambunctious little humans. Our spy, Associate 4118-23432B, otherwise known as Edwina, believes Gabby can be trusted with the truth: aliens are living among humans on Earth. And here at A.L.I.E.N we believe that even extraterrestrials need a babysitter now and then. No one was up to the task...until now. Emmy-nominated writer and New York Times best-selling author Elise Allen made a name for herself with her acclaimed young adult novel Populazzi (Harcourt), and the Jim Henson's Enchanted Sisters chapter books (Bloomsbury). In television, she has written for talent ranging from Bill Cosby to Kermit the Frog, and is currently writing for the new Disney Junior show The Lion Guard. Her dog may or may not secretly be from another planet. Daryle Conners is an award-winning writer, filmmaker and video game designer. She writes joke and riddle books and has designed many game titles for the PC and iPhone/iPad including Harry Potter and the Sorcerer's Stone, Scene It? Harry Potter, Hot Wheels Slot Car Racers, and Scene It? Twilight Saga. Her non-fiction books include Lunchtime LOLZ, Nintendo DS Hot Tips, ROFLs,Video Game Secrets and Monster High Jokes, all for Scholastic. Daryle lives in Seattle, where she still babysits from time to time. Disclaimer: All prizing and samples provided by Disney Publishing. Sounds like something my daughter would love! Congrats on the release and thanks for the giveaway chance. I want to win it for my 13 year old since she loves to read, and yes, summer vacation is coming up quickly! I want to win it for my 13 year old sister who loves everything about Disney and also likes reading books. Thank you so much for this giveaway! My oldest son would LOVE to read this book and he's really into space/rockets/aliens so I know he would also love the UFO light up flyer. I would love to win this for my son! He loves reading and is very fond of anything alien related!